Over the years I have had a lot of experience mowing. Since we left the farm and transitioned from John Deere tractors and Heston mower-conditioners, I have trusted Toro mowers. We had one in Canada that handled our recycled sheep pasture at our first home on the shores of the Bay of Fundy in Nova Scotia. It went with us to New Brunswick where we farmed, and it eventually did clean up behind a Cub Cadet. The Toro even followed us to Halifax, Nova Scotia and handled our suburban Clayton Park yard which was installed on about four inches of soil on top of some of Halifax's solid rock. We finally got a new Toro in Roanoke, Virginia and after serving as a workhorse for my son in his lawn mowing years while at the same time taking care of the home place for many years, it eventually gave up the ghost. I got a fancy self-propelled Toro because you could no longer buy a decent sized mower without it being self-propelled. My wife gave it one try and pronounced it the spawn of the devil as it dragged her around the yard. It did take some getting used to, but I found it a reliable helper on our Roanoke patch of grass. 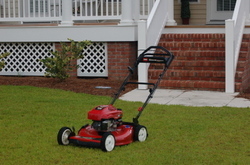 When we got a home in Cape Carteret, NC., I ended up using a Honda mower for a while. The Honda never felt like a Toro, but it did the job, and there was no reason to use something else. The Honda ended up leaving the coast, and I was faced with the prospect of getting a new mower. I tried all the local shops and was almost seduced by the colors of a John Deere mower until I checked Consumer Reports and found that five of the top six top rated mowers were Toros. The Honda was also on the list but rated lower than the Toros. No one that I could find in our coastal area carried Toros. Finally I checked Toro's website and found a dealer nearby. I called them, but the cheapest Toro they had was a fancy model with an aluminum deck and electric starter costing nearly six hundred dollars. The owner of the shop did tell me that Home Depot sold the more inexpensive Toros. We made a trip to Home Depot in Jacksonville on Saturday and purchased the least expensive Toro that they had. It was around $369 before taxes and came with Toro's Personal Pace system which was an expensive option the last time I bought a mower. The first time I used the mower it was like a revolution in technology to me. The mower matches my walking speed and is smart enough to know when I stop and when I backup. It is without a doubt the best innovation that I have seen on a piece of home equipment in a long time. It is certainly something Toro should be advertising, but then again the ranks of people willing to walk behind a mower are thinning rapidly. The Toro makes the Honda that I was using look like a dinosaur, and it approached being double the price of the Toro. The Toro is so good that just maybe it will fit the hands of my wife, but I doubt if I am willing to give that a shot since the Toro makes the yard so easy to mow.